Khartoum: Sudan’s defence minister said yesterday that President Omar Al Bashir had been taken into military custody, announcing an end to his 30-year rule. In a statement broadcast on state TV, defence minister Awad Mohammad Ahmad Bin Auf said that Al Bashir had been detained “in a safe place” and that a military council would run the country for a two-year transitional period under his rule. Sudan’s state media also reported that all political prisoners, including leaders of the protests that precipitated Al Bashir’s fall, were in the process of being released from jails around the country. We will only accept a transitional civilian government. The announcement by Awad Bini Auf, who is also Sudan’s vice president, came after four months of nationwide street protests sparked by price hikes on basic goods but also reflecting a deep-rooted desire for the replacement of his decades-old regime. Al Bashir is accused of committing crimes against humanity and genocide in Sudan’s Darfur region and has been indicted by the International Criminal Court. The details of the apparent coup were unclear as was the future of a massive sit-in protest in the capital Khartoum.However, the main organiser of protests against Al Bashir rejected the statement by the defence minister. The Sudanese Professionals Association (SPA) was also calling on protesters to maintain a sit-in outside the Defence Ministry that started on Saturday. Bin Auf also said Sudan’s air space would be closed for 24 hours and border crossings shut until further notice. Sudanese sources said Al Bashir was at the presidential residence under “heavy guard”. A son of Sadiq Al Mahdi, the head of the country’s main opposition Umma Party, told Al Hadath TV that Al Bashir was being held with “a number of leaders of the terrorist Muslim Brotherhood group”. 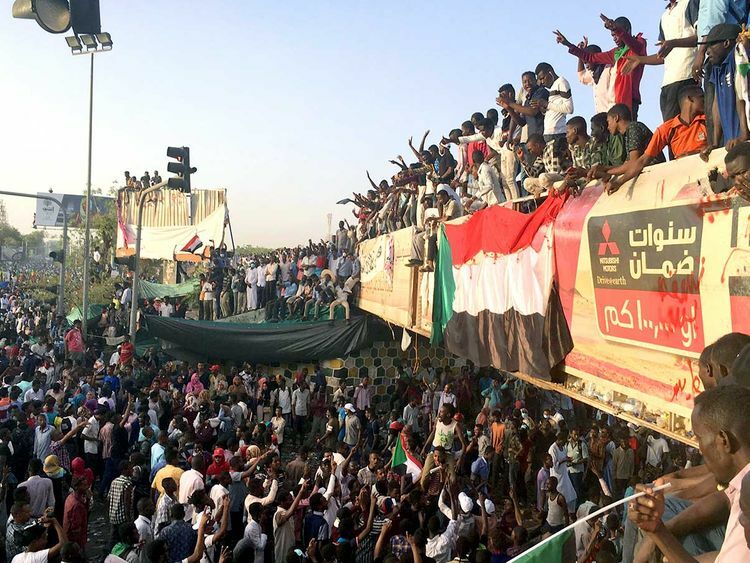 Hundreds of thousands of Sudanese revelled in Khartoum’s streets this week, singing, dancing, and waving banners imprinted with hopeful slogans calling for the rebuilding of their country. Demonstrators have called for a civilian government and said they would not accept an administration led by military and security figures or Al Bashir’s aides. State television and radio played patriotic music, a reminder of how military take-overs unfolded during previous episodes of civil unrest. Troops deployed around the defence ministry and on major roads and bridges in the capital.